Thank you for sharing. Lee would be very proud of you. Many of us will experience mental health issues at some point in our lives. Sadly, appointments with CPNs, psychiatrists and counsellors can take weeks. Even then treatment is for a limited period due to funding constraints and the growing numbers waiting for help. When someone requires hospital admission due to the severity of their illness often no bed is available. 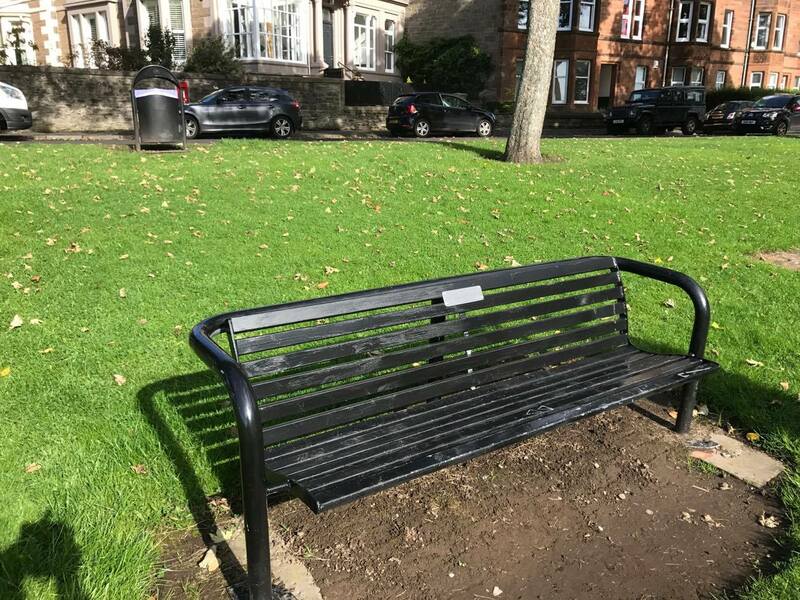 Alternatively, a free bed can be miles from home meaning the person is isolated from their family and/or friends at a time when they need support more than ever. More money should be available to provide vital local services and support for as long as it takes for the person to recover. Folks should not be left to struggle on their own. Giving someone anti-depressants when they clearly need specialist treatment is not the answer. No one knows what circumstances might cause them to suffer from mental health issues. All lives matter. 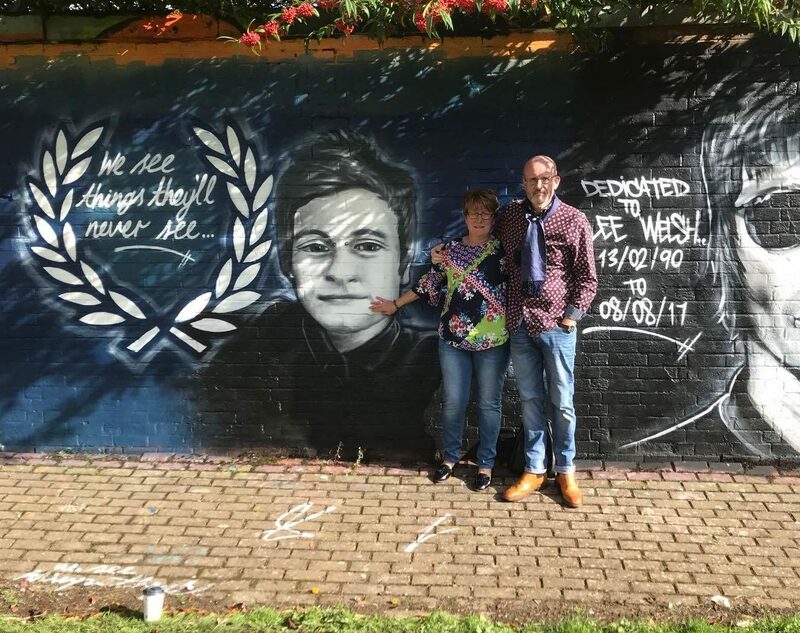 Lee’s parents Phil and Lesley with a mural dedicated to their son. Tickets still remain for a fundraising evening launched to mark the life of a well-loved Dundee man. 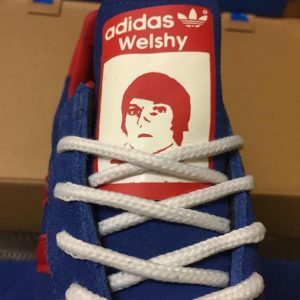 Lee Welsh, 27, died in August. His family have since campaigned relentlessly for enhanced mental health care provision and have worked tirelessly to commemorate their son. On Saturday evening, a fundraising night in tribute to Lee will be held in Dundee’s Skyaxe Combat and Fitness Centre from 7.30pm. The gathering, organised by Lee’s friends and family, will include a race night, charity raffle and disco. 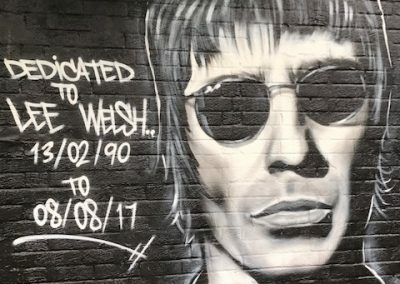 Tickets for the celebration of Lee’s life have sold quickly, but some still remain. Lee’s close friend Gary Shields hopes Saturday’s fundraiser can act as a tribute to Lee. He said: “Lee was a very funny guy. Tickets to the fundraiser are priced at £5 and raffle tickets can be purchased for £1. As an update to this article the family of Lee would like to thank all who attended the event which was an extremely special occasion. We as a family would also like to thank all who contributed to the event either by the donation of prizes, or indeed sponsoring a horse. We would especially like to thank Gary Shields, Steve Martin and Ryan Taylor for putting the entire event together and arranging many of the fundraising events which led up to the evening. When a total of the amount raised is available we will update here. 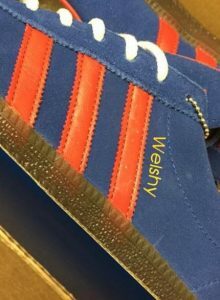 Kris Boyle a local entrepreneur surprised Lee’s parents with a bespoke pair of Adidas trainers dedicated to Lee. Some images of a portrait of Lee by SYKE Graffiti, a surprise commission by friends of Lee who invited Phil & Lesley to a surprise viewing. These images are graffiti art by SYKE Graffiti, done in Dundee in Lee’s memory. 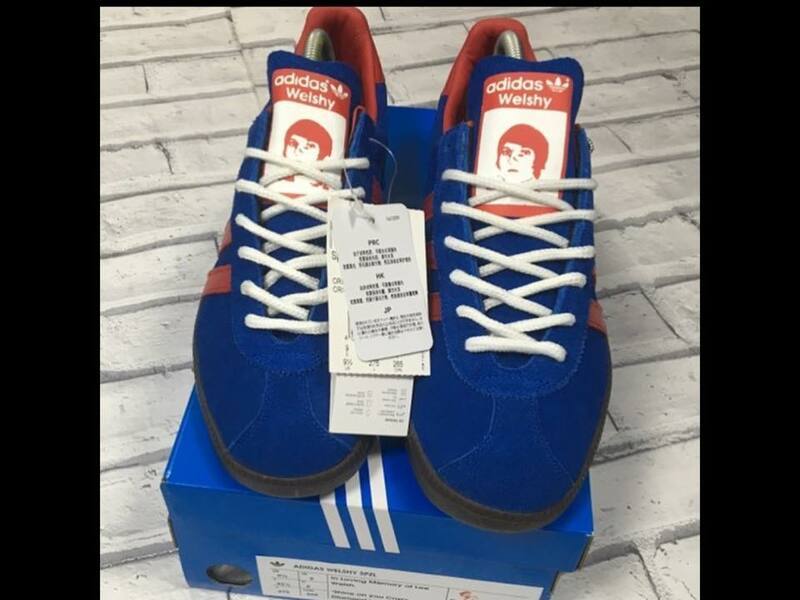 Lee was a huge oasis fan. A moving musical tribute has been paid to Dundee man Lee Welsh. 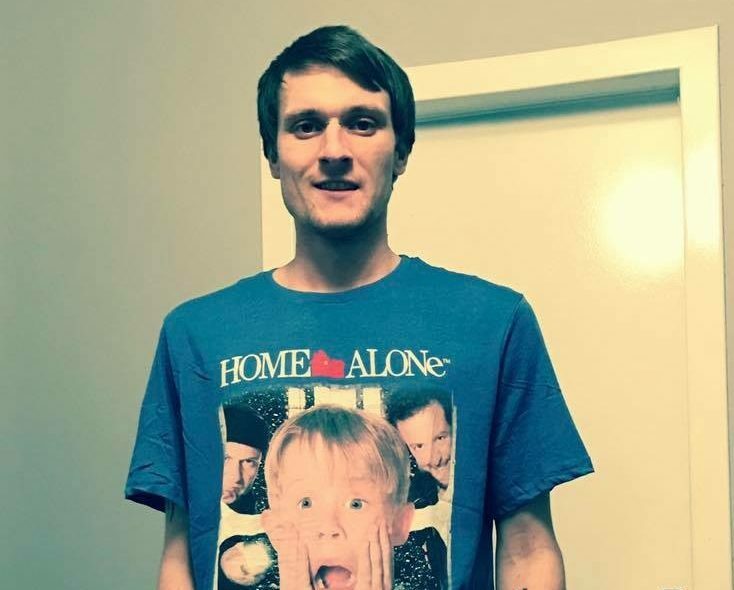 Talented musician Lee, 27, took his own life in August. The 27-year-old’s family has since campaigned for enhanced mental health care provision. 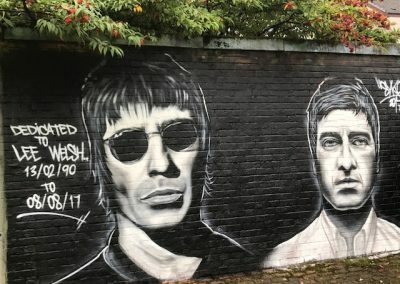 Music fan Lee has had an Oasis mural dedicated to him. 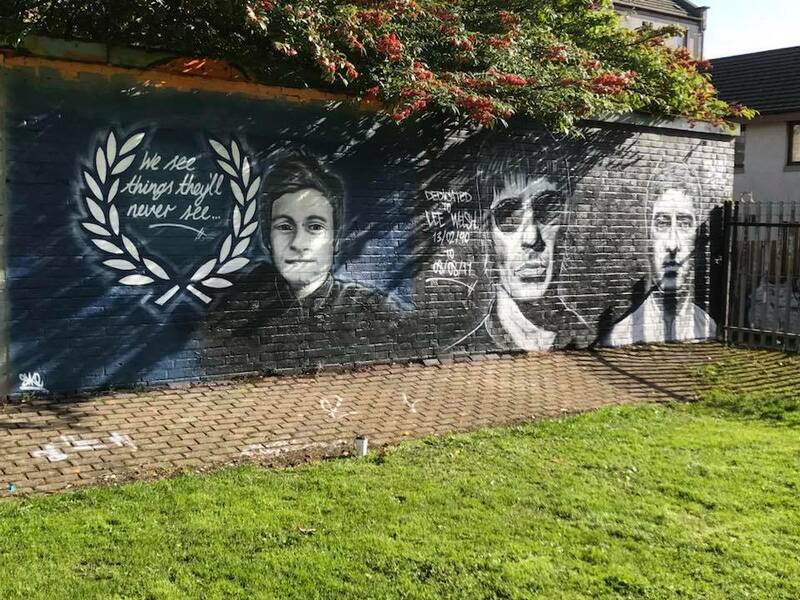 Lee’s name has now been included within a graffiti design in a Dundee park. 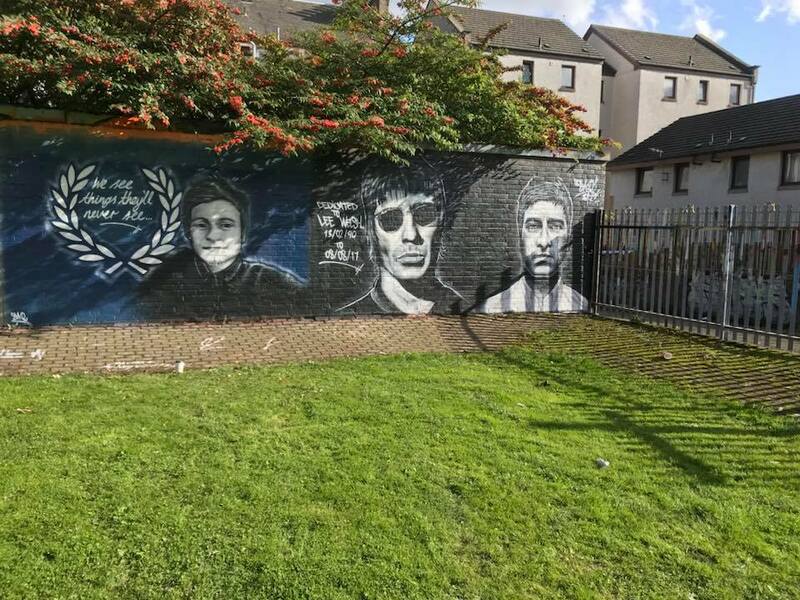 A local artist had created an Oasis mural within the DPM Park, just off Dundee’s Canning Street. 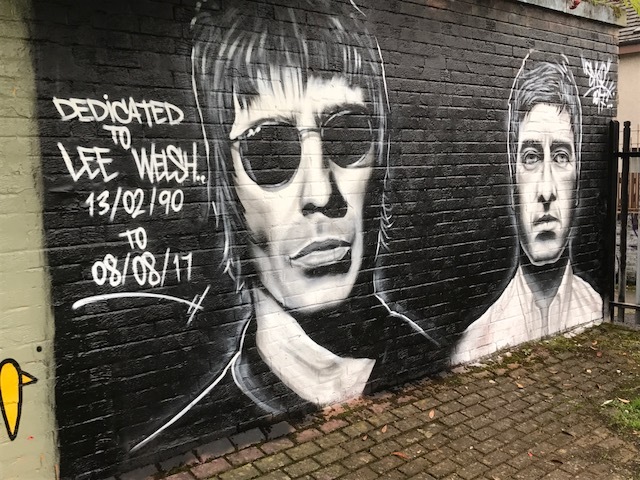 However, the mural was then tagged with a dedication to Lee at the request of his parents Phil and Lesley. 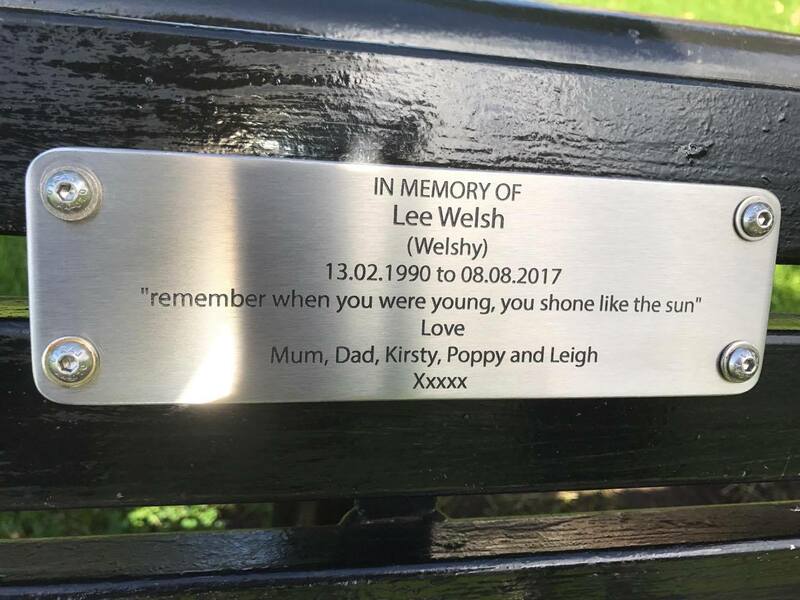 In addition to the grafitti tribute, Lee’s family and friends plan to buy a memorial bench in his memory. A race night and disco to raise funds for the bench will be held in the function suite of Dundee’s Skyaxe Combat and Fitness Centre on November 18. Tickets for the event are on sale now and can be purchased by contacting Lee’s close friends Gary Shields and Ryan Taylor. A website has also been created in Lee’s honour to share stories of mental health which can be shared with politicians and charities. 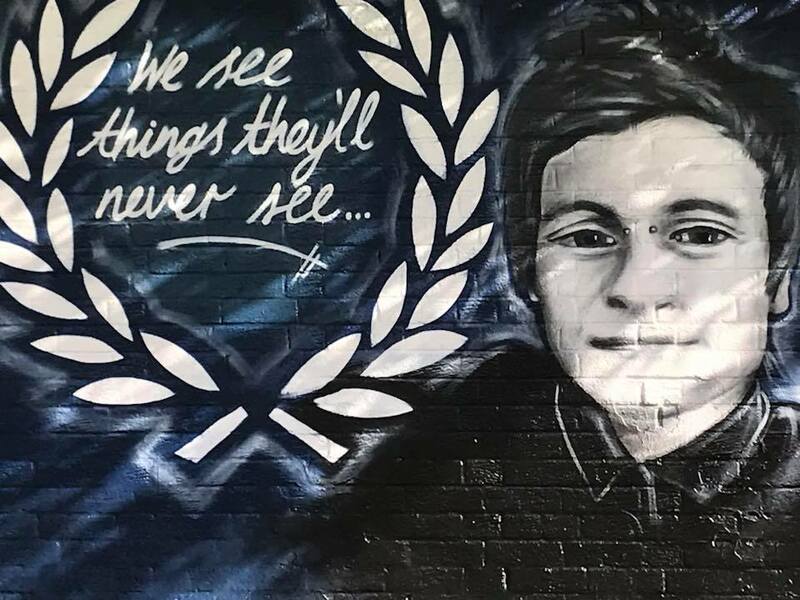 A tragic Dundee dad has been honoured in a mural alongside one of his favourite bands. 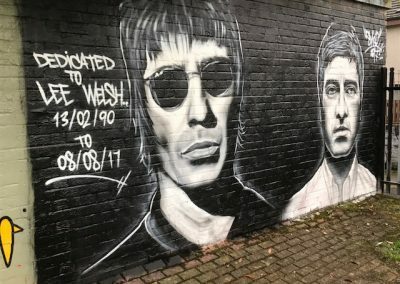 The tribute was paid to Lee Welsh, 27, as part of a graffiti mural depicting Oasis stars Liam and Noel Gallagher. The art recently appeared at the former DPM factory in Hilltown — a designated site for graffiti art — and was created by SYKE Graffiti. Lee, a father-of-one, was found dead at his home in Peddie Street in August leaving his family and friends devastated. Dad Phil, 48, said he and his partner Lesley Nicoll were “over the moon” with the tribute and that it has brought them some comfort during their difficult time. 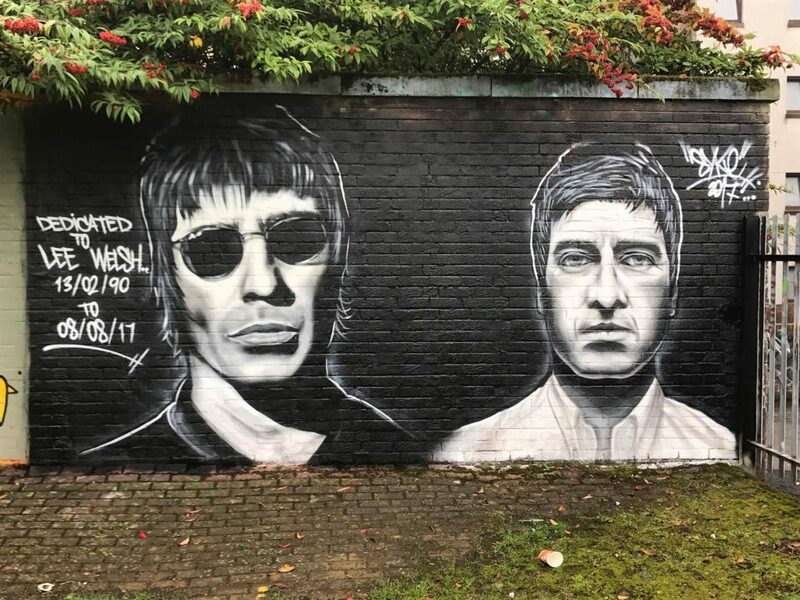 Phil said: “We noticed the mural had appeared overnight by SYKE Graffiti. “Lesley had dropped a message to the guy behind it and he said that he knew about Lee. “So, he has come up and added the dedication about Lee and we’re absolutely over the moon with it. “The guy’s not doing this for any publicity or anything like that. “I just thought it was a wonderful thing to do. Lee was known in the city for his musical exploits with his band Modern Culture. His memory was honoured recently with a night of music at the Royal Tay Yacht Club. The Tele previously told how Lee battled mental health issues for almost a decade prior to his death, which has prompted his parents to campaign for greater action in assisting people with similar issues. Phil added: “It’s been a difficult time for us with everything that has been going on, but something like this has given us a wee boost. “Lee and I used to have debates about Oasis because he loved them and I wasn’t much of a fan. “He went to see them at Hampden years ago, but I never went. “But he did manage to get me to kind of like Noel Gallagher’s solo stuff. 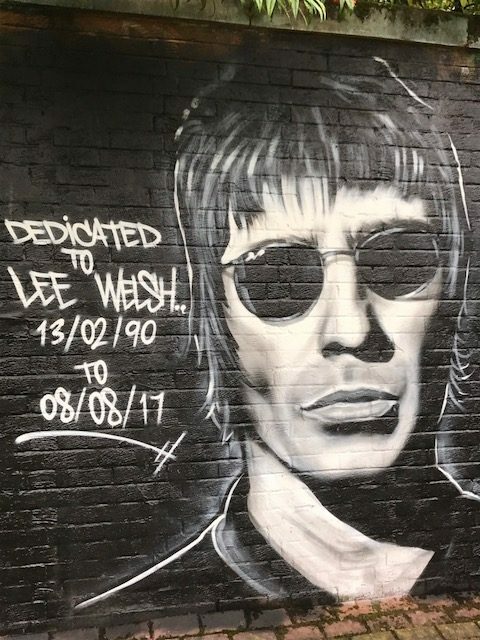 Symon Mathieson from SYKE Graffiti added: “I was approached by Lee’s family as they saw the paintings I did at the DPM. 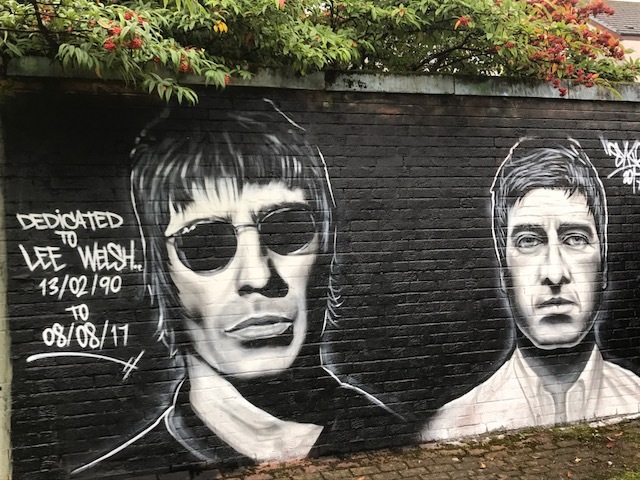 “Lee’s mum explained to me that he lived in the area and was an avid Oasis fan and asked if I would put Lee’s name as a dedication.